So, I'm happy to report that after months of telling Tony stories from the Bible, the lives of the saints, Jesus and Mary, some of my efforts have paid off. Will always drops Alessandra and I off in front of the church, and then he parks the car and comes in with Tony and my diaper bag. (My back is so bad lately that walking too far with a baby and diaper bag in my arms causes serious pain). As I was unbuckling Alessandra from her car seat, Tony pointed at the cathedral, and said, "Mama and Sissy go see Jesus!" It was adorable and awesome at the same time. Alessandra gets a C+ for Mass behavior today. I'm beginning to notice a pattern with her; she's on her best baby behavior until the middle of the homily, and then she starts to get fussy. Will and I take turns walking around the narthex with her. All in all, not an unpleasant experience. There's tons of little ones in our parish, and we are always greeted with smiles and kind words. Anyway! On to the fashion! Have a beautiful Sunday! 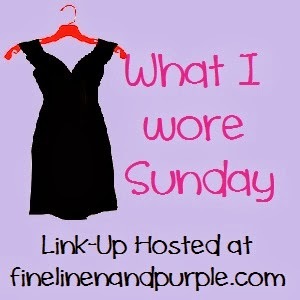 For more stylin' outfits, check out Fine Linen and Purple! Everyone looks fabulous this fine Sunday!! I love that cobalt blue. Stunning color. Have a great day!! Thanks Mary! Hope you had a great day as well. I love Tony's nickname! There's just something about kids that cries out for food-related nicknames. We call Frannie "Fran-cake" and "Fran-ana" all the time. Hahaha, thanks Katie! As much as I'd love to take credit for his nickname, that was all Will. :) Frannie is just adorable!